A small group of attractive evergreen trees and shrubs with pretty spring flowers and autumn fruits. Mature plants often have attractive peeling bark. Ideal for use as a specimen tree or as background plant in a border or shrubbery. Foliage: Dark green leathery leaves. Evergreen. Attractive peeling bark. Flowers: Small, bell-shaped, white or pink blooms, followed by red, strawberry-like fruits in autumn. Soil: Moist but well-drained, deep soil (clay, sand or loam). Acid or neutral pH. Conditions: Full sun or partial shade. Can be grown in any aspect, in a sheltered location. Protect from drying winds. Type: Large shrub or small tree. Origin: Southern Europe, Southwest Ireland and Asia Minor. Hardiness: Hardy in most regions of the UK (down to -10°C). Note that young plants tend to be more frost-tender than mature specimens. Plant out young trees or shrubs in the spring or autumn. Water frequently in dry weather until well established. 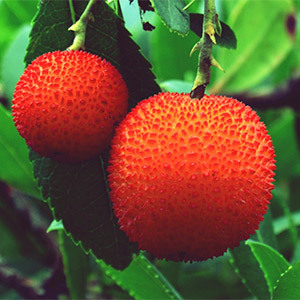 Strawberry trees dislike being moved or transplanted, so choose your site carefully before planting. 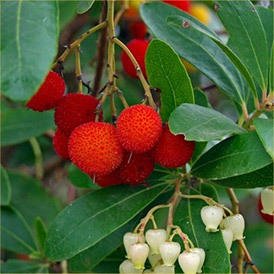 Note that some species of Arbutus can eventually grow to a mature height and spread of around 26ft (8m). Provide staked support until well established. Protect young plants from frost until well established. Protect container grown plants from severe frosts. Not normally required. If necessary, you can prune in late winter or early spring to remove any dead, diseased or damaged shoots or branches. May be susceptible to aphids and leaf spot. Propagate by hardwood or semi-ripe cuttings in the autumn. Root in a light sandy soil in a cold frame. A. unedo ‘Rubra’ is a more compact variety with pink flowers. Available from Thompson & Morgan. A. x andrachnoides has an attractive cinnamon bark.